There's no tennis currently being played at the O2, which means there's not much point continuing with this live coverage. We will be back at about 20:00 GMT to guide you through Roger Federer's match with Tomas Berdych. Thanks, as always, for joining us this afternoon. See you in a bit. Eddie Holmes: Nadal is the best, has a far better head to head record against Federer, won 81 straight matches on clay, nine French Opens as well. Nick: Federer has had the greatest career of all so far, but Nadal is the better player (23-11). Djokovic could surpass both, though. "Andy Murray is in great shape. He's set his stall out, he wants to win the Davis Cup.The effort and the energy he's put in, I just don't want him injured. I always thought he'd be here and I'm glad he is." The next match we have to look forward to is Roger Federer's duel with Tomas Berdych. The Swiss always enjoys home-like support in London so Berdych will have to overcome one of the greats, and the crowd. That match will start at about 20:00 GMT. It's on Monday that we will see British number one Andy Murray as the world number two will take on David Ferrer. The Davis Cup final against Belgium later this month is the Briton's priority, but he will not take Ferrer lightly. James Walker: Novak...will become statistically the best player in the world for sure..... he is so dominant.... maybe does not have the flair of others, but he is the best in an era where there are some great players!! Federer and Nadal have the hearts of more, and of course my favourite Andy Murray....but make no mistake if Novak does not get any serious injury he will break all stats! Sally Caiger: Nadal for me. Mentally so strong a lot of players would have retired but his passion is still there . He will be back next year. The world number one poses for pictures with his latest prize before going on to add his signature to a number of paraphernalia being shoved in front of him. Djokovic asks to say a few words to express his sympathies with the people of Paris after 129 people were killed on Friday in attacks in the French capital. It's a big piece of silverware Novak Djokovic holds aloft. He'll need a double garage for that shiny jug. "It's the best season, best year of my life," says Djokovic. "I've been experiencing some of the peak time right now and everything got together. "I've had lots of success, but 2011 and 2015 definitely stand out. I'm looking back with great pride and joy. My team definitely plays a part in this." Another victory for Novak Djokovic, who will receive his ATP World Number One trophy in a special presentation. He's only the sixth player to secure the year-end number one spot on four or more occasions. Paul Staveley: You can't judge a career until it's over - Djokovic is best in world right now but best of all time with no French Open? Not yet. Jiten Chandarana: Is the one thing separating Novak from the others, the ability to hit an attacking stroke from a defensive position? Tom: Federer is the greatest not just for his dominance, but also his elaborate style of play. Quote Message: That was an absolute demonstration of world-class tennis from Novak Djokovic. A brilliant performance. That was an absolute demonstration of world-class tennis from Novak Djokovic. A brilliant performance. An ace from Nishikori! The world number eight skipping not so merrily to 30-0. Djokovic relentless in his pursuit of his opponent, sprinting to the tape and nicking a point off Nishikori with a deep volley. At 30-30, Nishikori looks fragile but a clumsy return from Djokovic lets his opponent off the hook. But from 40-30 to deuce and the world number eight coughs up another double fault. The underdog slaps a forehand into the tape - match point Djokovic... and the Serb's coup de grace is a backhand volley into the corner. Brilliant from the world number one. Djokovic untroubled in what could be his final service game of the match. A wild return from Nishikori allows the Serb to march to 40-15 and the Serb's serves are far too hot for Nishikori to handle. Is this the end, or the beginning of it? Llion Bevan: Djokovic is pure class, the only reason people are saying he's boring is because nobody else can touch him right now. Not the greatest ever though, that's Federer. Richard Kellman: Sampras, Nadal, McEenroe,Borg, Djokovic and Ivan Lendl are the greatest male players of all time.Federer is overrated, he is brilliant,but he has never dominated when he's played against great players! Djokovic's return touches the paint, brilliant from the Serb, and that earns him a break point. Nishikori folding like a deckchair in the wind, the barrier feels as if it's 6ft tall, and it won't be long until this match comes to an end. Quote Message: There's no taking his foot off the gas even though Djokovic is up 6-1 3-1. There's no taking his foot off the gas even though Djokovic is up 6-1 3-1. Cute. Djokovic tip-toes to the tape and undoes Nishikori with a feather-soft cross-court dropper, levelling at 15-15. Every Nishikori point being greeted with wild cheers, but there's always one or two sloppy errors in each game from the 25-year-old. An opportunity for Djokovic at 30-40 - the pair slug it out from the baseline, bishing and bashing, before Djokovic goes on the prowl, advancing, advancing, until he puts his opponent away with an overhead. To deuce we go. Nishikori under the cosh. Djokovic coolly lasers an ace down the middle, sends Nishikori running after fresh air, and at 40-15 the top seed again looks irrepressible. Nishikori falters on the next return and this is all too easy for the world number one. Stijn Welkenhuyzen: My GOAT is Rafael Nadal with Nole second and Roger on three because his poor head to head against Rafa. 2 - 8 in Grand Slams! Jonathan Woodrow: When Djokovic wins Roland Garros, he'll be right up there. Nishikori coughs up a double fault to allow Djokovic to level at 30-30 and the crowd groans in unison. Djokovic with a rare dash to the net after putting his opponent on the back foot with a pin-point forehand into the corner, but he messes up the volley and Nishikori is off the hook at 40-30. The Serb unable to come back this time. Wild cheers as Nishikori wraps up the game, but the outcome of this contest already feels predictable. Is he the greatest ever? Maybe not yet, but make no mistake Djokovic is ruthlessly hunting down enough match wins and titles to barge his way into contention. He has not lost at this event since 2011 and Nishikori will not be ending that run if he keeps making errors, number 15 handing over a break at the start of the second set. The O2 crowd are doing their best but a bit of a challenge on court is required to get them really going. Djokovic was at his most fragile in that game, making uncharacteristic errors, but still he comes away with the game - Nishikori going wide by 0.00001mm to end a game full of ifs and buts. A double fault from Djokovic, the first of the match, is followed by a sluggish forehand into the tramlines, the Serb's feet not moving in unison as he scoops a forehand wide. 30-30. Hope for Nishikori. The world number eight advances to the net, but all he can do is watch a Djokovicy passer fly by. Djokovic reaching the impossible, but this time it's the Serb who has to watch the ball whiz by as Nishikori follows up with a winner down the other side. Deuce. Questions at last being posed on Djokovic's serve. Jiten Chandarana: Novak is in the top 2/3 greatest ever, as long as he wins the French Open. He has beaten Rafa at the French, Roger hasn't. Nicole: Roger Federer will always be the greatest tennis player of all time. Just look at his Grand Slam and his career titles. Alex: Rafa is the greatest. Won all 4 slams, including nine French Opens. Won Olympic singles gold and has dominated Federer 23-11 in their careers. A new racquet for Djokovic at the beginning of this set, Nishikori hoping for a new beginning. The 25-year-old is hitting the corners, but Djokovic is retrieving with ease, forcing his opponent to hurry his shots and make sloppy errors. The highlight of the game for Nishikori is a canny forehand which kisses the tramline - HawkEye shows it was in despite Djokovic's protestations - but Djokovic has two break points and wraps up the game on the second bite. It's one-way traffic. Nishikori attempting to outwit Djokovic from the baseline, but he's come a cropper so far. Ella Rose: Behind Federer, Nadal, Samoras, Borg and Agassi. Yet to win Roland Garros, yet to win Olympic gold, behind in head to head with Nadal, has won less grand slams than many others. And just not entertaining to watch! Wally Thornton: Federer and Nadal are past it but at their best they would beat Djokovic. Best tennis was back in the 1980s. FACT. Whatever Nishikori throws at Djokovic, it just comes back with added venom. The Serb's defence is impenetrable, his attacking skills sublime. An unreturnable serve out wide eases him to 40-15 and the defending champ follows up with another menacing serve to the wings to end the game and the set. Nishikori needs to be at his best to have any chance of defeating Djokovic, and an ill-timed sliding volley into the net suggests the 25-year-old is not at the peak of his powers today. He has already made 10 unforced errors, which is way too many against the world number one. At 15-15, Nishikori loops a backhand long. He winces. Djokovic alert to every ball... lunging, sliding... Nishikori long once more - two break points Djokovic - and the world number eight messes up an attempted dropper to gift the Serb another game. Here's a selection of your thoughts from our Facebook page. Dean Jackson: You'll find out at the end of his career by how many Grand Slams he's won and how long he spent at number one in the world. For me he's one of the very best but will never get close to Roger Federer! Michael Nee: Second, could surpass Roger Federer in 2/3 years’ time if he continues like this year. Jack Connor: Top 10. Not top five though. Little energy is exerted during Djokovic's serving games, a cute dropper here, a dreamy serve into the ribs there, and Djokovic comes away with a hold to 15. Simple, effective, but mind-boggling when you're on the receiving end. Ajay Venkat: Djokovic has been very dominant, but the first player to exert such dominance over modern tennis? Roger Federer. After all, 17>10. Zach Kingsbury: Roger Federer. The maestro. Self explantory really. The games on the Nishikori serves have been marathons, but the 25-year-old manages to scramble away from the Serb, two quick points and he holds for the first time in this match. Nishikori, dressed all in black - black bandana, black socks, black trainers... but there's some light for the world number eight as Djokovic goes long to end a lengthy rally. 30-0. But Nishikori pushes a get-able volley beyond the baseline when he had the court at his mercy, then rashly directs a forehand into the tramlines and the Serb is breathing heavily down his neck at 30-30. To deuce we go. It must be disheartening playing against a match who can fetch and retrieve all day long. Brilliant from Djokovic, a snappy crosscourt winner for a break point... but Nishikori uses his brain and adds a bit of brawn to a down-the-line winner, which even Djokovic applauds. Deuce once more. Djokovic running from side to side, trainers squeaking as if he's being serenaded by chipmunks. The Serb oozing confidence, playing with control. Nishikori has to play three or four winners per rally to even win a point and, of course, very few men can do that. Djokovic 40-15 up and concludes a confident hold with a mighty ace. Charlene Beedie: Who is the greatest?! In my opinion it's Djokovic. No-one has dominated like this and he will get better and dominate some more. Jack London: Djokovic is the best player ever. He had to overcome Federer and Nadal in their prime to be where he is now. Oof! A cracker of a winning forehand down the line and Nishikori celebrates with a clench of the fist, while the crowd purr in admiration. Nishikori at advantage, but he's dragged back to deuce. Djokovic isn't a man who can easily be tamed. Forehand into the tape from Nishikori, the crowd groan, and Djokovic has another break point. And he's ruthless this time, into the net again from Nishikori. Djokovic dominant. Warm applause from the 17,000-strong crowd as Nishikori wins his first point of the day. The crowd perhaps too sympathetic in their support as Nishikori is the eighth best player in the world and we've only played the one game. The 25-year-old playing with aggression, playing with power, but Djokovic's defence is solid. Nishikori clips the net, the ball bounces wide, giving Djokovic a whiff at 15-30, and then he proceeds to balloon a forehand into the tape to gift the Serb two break points. But Nishikori digs deep, goes on the front foot, towards the tape, and Djokovic swings long. One more break point to go... an iffy dropper from the Serb and Nishikori pounces. He lives on. For now. Deuce. Novak Djokovic gets the match under way and the opening two blows go his way. The Serb easily 30-0 up, and arrows an ace out wide to serenely progress to 40-0. A forehand into the net from Nishikori, ending a mini rally - and it's a smooth start for the defending champion. On top from the get-go. Quote Message: Nishikori doesn't have a big serve but he is a great mover and hits well off both wings. He has to take the ball down the line, over the high part of the net where there's greater risk, but you have to roll the dice and go for your shots. It'll be interesting to see if he can have an impact from the back of the court. Nishikori doesn't have a big serve but he is a great mover and hits well off both wings. He has to take the ball down the line, over the high part of the net where there's greater risk, but you have to roll the dice and go for your shots. It'll be interesting to see if he can have an impact from the back of the court. What a year it's been for Novak Djokovic. He will end the year as the world number one, he's won the Australian and US Opens and Wimbledon, and has not lost since the Cincinnati final in August. In fact, he's only lost five matches this year. Such a blizzard of incredible stats lead us to ask: where does Djokovic rank in the pantheon of tennis greats? Is he the best there's ever been? Tweet us your thoughts using the hashtag #bbctennis. This afternoon we start with the Stan Smith group, featuring Novak Djokovic, Roger Federer, Kei Nishikori and Tomas Berdych. Djokovic and Nishikori will get us started, while Federer and Berdych will do the entertaining at about 20:00 GMT. For those of you who like moving pictures, you can watch the action by visiting the 'live coverage' tab at the top of this page, or listen to the action via BBC Radio 5 live sports extra (also available at the top of this page). How does all of this work? The world's eight best ranked players are meeting in London for a season-ending finale, a chance to fill the coffers with at least a few thousand pounds before Christmas. The wold's best have been split into two groups - groups which have been named after greats Stan Smith and Ilie Nastase - and will compete in round-robin matches. The top two progress to the semi-finals to battle it out on the usual winner-takes-all basis. It should be an entertaining week. One match has already been completed this afternoon and it ended with victory for Jamie Murray and his doubles partner John Peers, with the duo beating Italian pair Simone Bolelli and Fabio Fognini 7-6 (7-5) 3-6 11-9. Novak Djokovic and Kei Nishikori are currently warming up which means the match will be under way shortly. The first singles match of the week pitches two thrusting young hopefuls against one another, the youngest players in the draw. The fact that Djokovic is 28, has been the best player in the world for the last five years and is trying to win this event for the fourth time suggests we are still waiting for a new generation. Nishikori, at 25, is one of those supposed to be knocking on the door, and he beat Djokovic in the US Open semi-finals last year. Now would be a good time to add another high-profile win to his CV. A minute's silence in memory of those who lost their lives in Paris on Friday night is impeccably reserved. Novak Djokovic bows his head, rests his racquet on the net. The two players receive a boxer's welcome into the arena... dry ice, dimmed lights, loud music and a Master of Ceremonies impersonating Michael Buffer. "Novak Djokoviiiiic," the man with the mic grandly announces as the Serb steps into the spotlights to prolonged warm applause. The Jubilee Line was packed, lines long and security understandably tight, but spirits seem high around the O2 Arena as it hosts the men's tennis season finale for the seventh time - with the ATP announcing on Thursday that the arrangement will last until at least 2018. 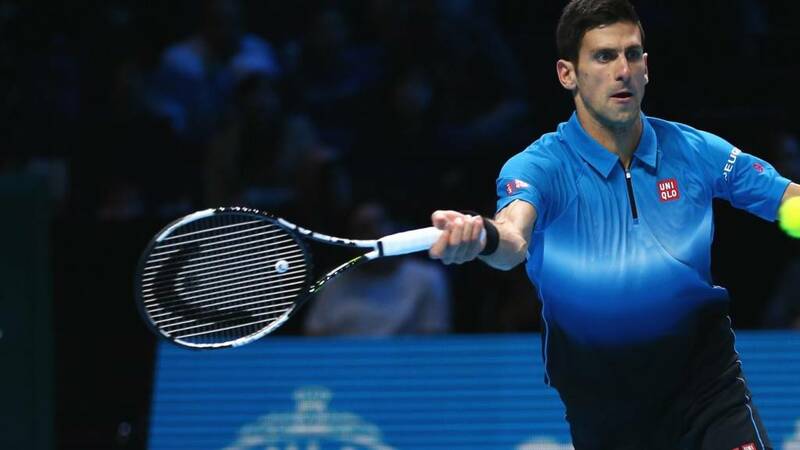 Novak Djokovic has suggested a five-year stay would be ideal at any location before the tournament moves on, but a near-capacity crowd of 17,800 is expected at all 15 sessions in London, which always meant it likely the ATP would extend the deal. Hello! Welcome to live coverage of the opening match at the ATP World Tour Finals. The competitors this afternoon? World number one Novak Djokovic and Kei Nishikori, the eighth best player in the world. When Djokovic plays, there's usually one winner, and that's Djokovic. The Serb has won 23 of his 32 ATP Finals matches. He's forgotten how to lose. But let's not write off Nishikori, at 25 the youngest player in the tournament. The world number eight knows what it takes to beat Djokovic, having got the better of the world number one in two of their previous six encounters, one victory coming in the US Open semi-finals. The big four seems to have become the big one, just the one man flying solo, on top of the world, enjoying the time of his life, enjoying one of the most successful years in tennis history. Can anyone beat Novak Djokovic? Stop him winning a record fourth successive Tour Finals title? It seems unlikely, but let's play along anyway.